Hello doctor.. my name is jefry .Ii`m from indonesia,i realy want to consult with you about herbal therapy. My mother(80) was diagnose from hospital in Penang has a tumour in he mouth. Do you have time ,this Friday ? So i can meet you with my mom. I really confuse. The doctor on adventis tell me that she need to be surgery. but i realy worried becouse she already old. I’m waiting for your respon as soon as possible. Reply: Where is she now? Come and see in at my centre … you can come tomorrow morning at about 11 am… or you come on Friday morning at the same time… you can call my wife at my centre — 6595881 — to tell her that you are coming. Bring all the medical reports and films. Reply: Doctor, she at penang now,waiting for the confirmation.yesterday i received the medical report,but the is no film.the check up is not overall yet. So we defenitly will come tomorrow at 11 am. Sometime in March 2005 he noticed a small lump on the underside of his left tongue. The lump grew bigger with time. He then started taking some Chinese herbs. After six to seven months, the lump appeared to have gone smaller in size but did not go away. Not satisfied, he went to a private hospital. An MRI indicated a 2 x 2 x 3 cm mass in the left paracentral aspect of the floor of the mouth. A biopsy was done and the doctor told him that it was moderately differentiated squamous cell carcinoma. According to the doctor, KT needs to undergo chemotherapy and radiotherapy first before surgery was to be attempted. Trusting his doctor, KT underwent seven cycles (7X) of chemotherapy and thirty sessions (30X) of radiotherapy. Unfortunately the treatments were not effective. So KT was asked go for another four cycles of chemotherapy. Again, the treatment was not effective. However this time, his jaw swelled and turned red. Then the swelling ruptured. The doctor gave up and told KT: Go and try Chinese herbs. TK came to seek our help. His condition is best illustrated by the accompanied photo. There are three lumps below the jaw. 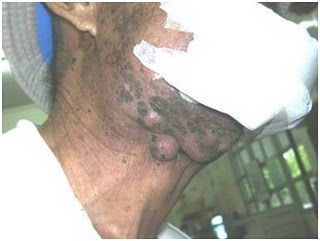 Notice also the “burnt marks” due to the radiation treatment. TK could not eat any solid food.